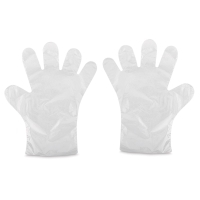 Cut down on cleanup with Glovies Disposable Gloves for Kids. These multipurpose gloves keep little hands clean — perfect for finger painting, tie-dyeing, papier mâché, and other messy arts and crafts. When the fun is over, just remove the gloves and throw the mess away! They're also great for science projects, cooking, gardening, and more. Made of waterproof plastic, Glovies are latex- and powder-free. They're lightweight and comfortable with an embossed surface for a better grip. The FDA-approved gloves help protect kids' hands from germs, too. Glovies are recommended for children ages 2 to 9. Each box contains 100 disposable gloves. They're great in a classroom or anytime you need quick and easy protection for small hands. ® gLovies is a registered trademark.